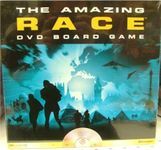 "The Amazing Race DVD Board Game has all the fast-paced action of the Emmy Award winning reality TV show! Host Phil Keogan guides you and your friends in a race through exotic destinations around the world. Wou'll compete in exciting challenges across the globe on your way to the finish line."